"A decent society is one whose institutions do not humiliate people"
Ethics or morals refers to the attempt to do the Good while interacting with the Other. Various systems have been proposed that set out the principles that help one to deliberately negotiate paths between various alternative courses of action (or inaction). These courses may include choices amongst various forms of Good - or various forms of evil, where some form of evil cannot be avoided. Of course, being systems they can be studied and critiqued. Unfortunately studying them provides few answers, but does impress upon one the extent of the problem and the importance of the question. The MPhil degree in Workplace Ethics at the University of Pretoria is one option available to those who wish to understand the nature of ethics better. Its focus is indeed one of business ethics: How does one attempt to get the organisation to act in a more moral manner (if organisations are indeed able to act in moral or immoral ways)? The picture is the group who completed their MPhil degrees in Workplace Ethics at the end of 2010. 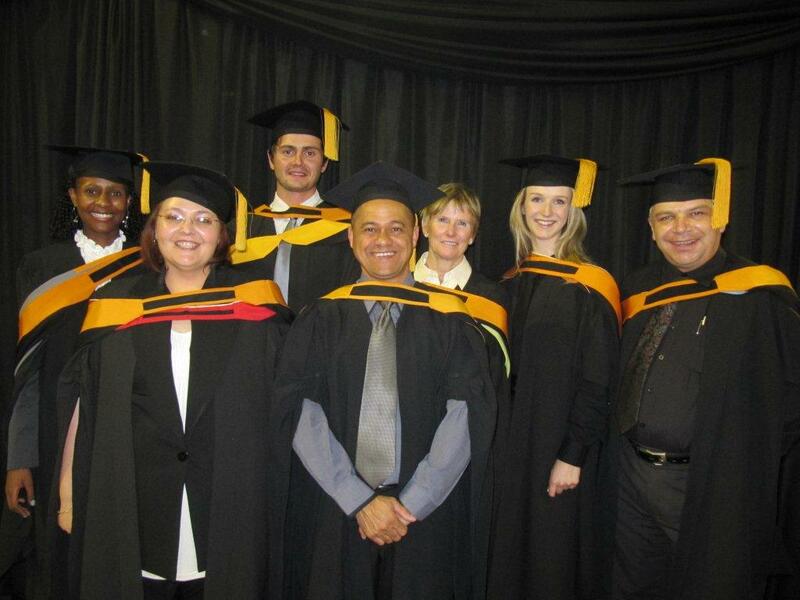 The picture was taken at the graduation ceremony on 6 April 2011. Thankfully I also made it - I am at the far right of the picture. The others are, from left to right, Thando, Mariaan, Cello, Jane and Candice. Coming from various backgrounds, more or less the only thing we had in common was a passion for ethics. Two years later we also have a piece of paper that confirms our qualification in ethics, hours of shared work, sweat and ideas. As noted we still do not have the answers, though. It was not the end of the studies, but the journey in which we found our pleasure.